Tasker is probably the best automation app for Android. And you can get it for dirt cheap right now. The app which normally costs Rs. 200 in India, is available for Rs. 60. That's about $3 in the US, and is on sale for $0.99 now. You can use it to do whatever you want the phone to do, without doing it manually. For example, you can set Tasker to turn down the ringer volume down all the way at night, i.e., put it on silent mode, so the loud noise from notifications don't wake you when you sleep. And the app can be enabled to turn back the volume on, during the day, so you don't miss calls. This is merely an example, the actual possibilities are limit less. You can auto enable the Wi-Fi when you are at home, enable GPS when you are away from home, open the music app when you connect a headset, and more. Before you buy the app from the Play Store, you should know that Tasker is not user friendly. It is very complicated to use, but don't worry, there are some guides available and a much cooler list of Profiles available on the Tasker Wiki, which you can configure with ease. 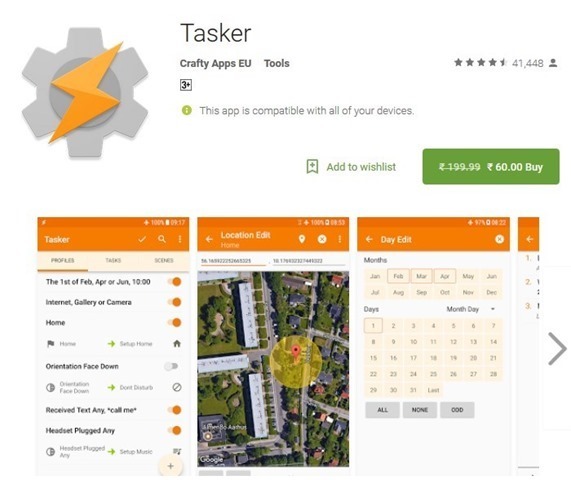 Tasker the total automation app for Android is on sale at the Google Play Store.